The El Dorado County Office of Education (EDCOE) Charter Adult Education program provides adult learners from every walk of life with a wide range of rich learning experiences tailored to meet their unique needs. The programs have been especially beneficial for adult learners who face a variety of life challenges. One such student is Kristy Arroyo, who attends classes at the Shingle Springs Band of Miwok Indians Rancheria. Kristy has faced numerous obstacles in her life, including being legally deaf, as she only has partial hearing. The Tribe recently purchased Kristy a new set of hearing aids, which has greatly contributed to her progress. Kristy is determined to earn her high school diploma through the Adult Education program, which is operated by EDCOE in partnership with the Tribe. The Tribe is supporting her in reaching her educational goals. Kristy has an infant daughter, so she is determined to be a conscientious student and mother. “I am so grateful this time around, with a new baby, and knowing what is best for me now,” stated Kristy. “Graduating and earning my high school diploma will help me find a job and provide for my child. 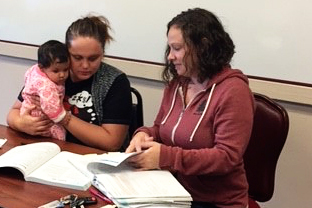 It has been a great benefit that the Rancheria’s Adult Education program is family friendly.” Kristy often arrives with her baby for her individual tutoring session where she can take notes and ask questions. Through this experience, Kristy has inspired her mother to begin working toward completing a high school diploma as well. Charter’s Adult Education classes are offered throughout El Dorado County in structured yet flexible learning environments, where all of the courses are free. More information about Charter’s Adult Education programs can be found or (530) 295-2259.